Article first published as Julia Child's Chicken Fricassee (Fricassee De Poulet A L'Ancienne) on Blogcritics. So there are three components of this recipe: braised onions, stewed mushrooms and the chicken fricassee. It may sound and even look daunting in print, but when you're in the kitchen, it's quite an approachable dish, even if you're not big on cooking. If anything, a majority of the work is put towards the prepping of the dish such as chopping the vegetables, trying up the herb bouquets, etc. Once all that is in place, it goes very quickly where you place it in a pot, cover and let it slow cook for awhile. It's definitely a meal where you'll have some down time. So get your wine and glasses ready. Give this recipe a try, pour yourself a glass and enjoy this French meal with someone you love. In a medium saucepan over low heat, add the onions, butter, chicken stock, seasonings and herb bouquet. Cover and simmer for 45 to 50 minutes. Add liquid as needed if too much evaporates. As the onions cook, they will become sweet and tender, yet still maintain it's shape. Once they are done, remove from heat and set aside until called for in the chicken fricassee recipe below. Bring the water, butter, lemon juice to boil in a small saucepan. Add the mushrooms and stir, ensuring they are covered by liquid. Cover and cook for 5 minutes. Set aside until until called for in the chicken fricassee recipe below. Pat the chicken pieces down with a paper towel, and season with salt and pepper to your liking. Heat a large dutch oven over medium-high heat and add 2 tablespoons of butter. Place a few pieces of the seasoned chicken in the dutch oven skin side down, being careful not to overcrowd the pan. I recommend frying in batches to get a nice color on the chicken. Once the chicken pieces are nicely browned, remove them from the pot and set aside. In the now empty dutch oven, add the remaining 2 tablespoons of butter. Sauté the mirepoix (carrots, celery and onions) over medium high heat and cook until tender. Season with salt and pepper to your tastes. Once the mirepoix has softened, add the flour and stir to coat the vegetables. Continue cooking for about 30 seconds to 1 minute to cook off the flour. Add the wine to the pot and stir, picking up the browned bits on the bottom of the pan. Then add the chicken stock. The liquid should start to thicken a bit. Add the herb bouquet and chicken back to the pot, nestled on top of the vegetables. Make sure the liquid covers the chicken and add additional chicken stock or water if needed. Taste for seasoning. Cover the dutch oven and cook at a low simmer for 30-35 minutes. Uncover the dutch oven and increase heat to high. Let the sauce reduce and thicken. Taste for seasonings and adjust as needed. Meanwhile, in a small bowl, add the egg yolks and heavy cream and whisk to combine. Carefully add a few spoonfuls of sauce from the dutch oven to the egg and cream mixture, while continually whisking. Be careful to not let the eggs scramble. Continue to add the sauce to the egg and cream mixture until it becomes warm to the touch. At that point, add the egg liquid mixture into the dutch oven. Mix well and the sauce should be a beautiful golden liquid. Bring the dutch oven to a boil and taste for seasonings, adding salt and pepper as needed. Add the lemon juice and a pinch of freshly grated nutmeg. Bring the heat down to a low simmer and add the braised onions and mushrooms; stirring well to incorporate. Add 2 tablespoons of softened butter and chopped fresh Italian parsley to the pot and stir again. 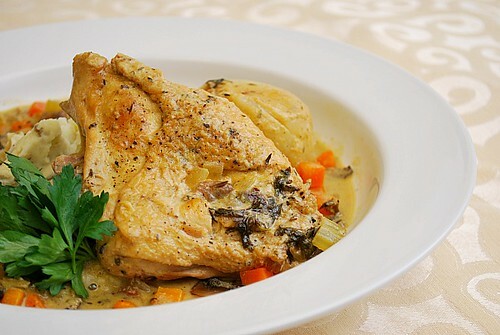 Serve the chicken fricassee with steamed rice or creamy mashed potatoes. Garnish with additional Italian parsley if desired. Mmmmm. can I bathe in that butter sauce!!??? When do you add the onions and the mushrooms? Do we add the fluid from the mushrooms? Please review the recipe above. -->> "Bring the dutch oven to a boil and taste for seasonings, adding salt and pepper as needed. Add the lemon juice and a pinch of freshly grated nutmeg. Bring the heat down to a low simmer and add the braised onions and mushrooms; stirring well to incorporate."